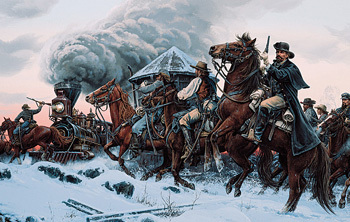 The "Raid on the L & N," painting by Civil War artist John Paul Strain depicting Confederate Captain John Hunt Morgan's winter raid of 1861-2, when Morgan lead his men behind Union lines. John Paul Strain depicts Morgan targeting the vital Louisville & Nashville Railroad. When news reached Lexington, Kentucky of the attack on Fort Sumter by Confederate forces in South Carolina, which heralded the start of the Civil War, "Lexington and the Bluegrass region, like the rest of Kentucky, was strongly divided," wrote J. Winston Coleman in Lexington During the Civil War. However, on the week after the fall of Fort Sumter, an armed body of men bearing the Confederate flag passed through the streets of Lexington, heading south to swell the Confederate army, amidst cheers for Confederate President Jefferson Davis. By May 1861, Lexington Unionist David A. Sayer, an aged banker, began receiving shipments of rifles and revolvers and distributing them in secret to his pro-Union friends, using his bank at Mill and Short Streets as a base. 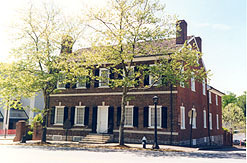 By this point, Lexington, along with the rest of Kentucky, had formed state guard companies to keep the state neutral. Indeed, the situation in Kentucky was so important to both the Confederacy and the Union that in September 1861, Kentucky-born President Abraham Lincoln wrote, "I think to lose Kentucky is nearly the same as to lose the whole game." Prior to the outbreak of the conflict, Kentucky was tightly bound to both regions. Although river trade, slavery, and a love of states' rights tied the Commonwealth to the South, a newly established railroad commerce and a historical devotion to the Union aligned many Kentuckians with the North. Through statesmen like Henry Clay, Kentucky had worn the mantle of compromise in settling conflicts between these two regions. In the crucial presidential election of 1860, two of the four candidates were Kentuckians. John C. Breckinridge, a Lexington native and former vice president, ran on the Southern Democrat ticket. Abraham Lincoln, the Republican candidate, was born near Hodgenville, Kentucky. Kentuckians voted for Tennesseean John Bell in the crucial 1860 Presidential election, whose Constitutional Union platform was based on the preservation of the Union. However, the election of Republican Abraham Lincoln in 1860 caused South Carolina to secede from the Union on December 20, 1860. Lincoln's Republican Party was known for its stand on halting slavery in the U.S. territories, which was anathema to many Southerners. By February 1, 1861, the remaining six states of the deep South-Mississippi, Florida, Alabama, Georgia, Louisiana, and Texas-followed South Carolina, forming the Confederate States of America. Camp Nelson, after March,1864, became Kentucky's largest recruitment and training center for African American troops. In all, 23,703 Kentucky African Americans served in the Union Army, the second greatest number of black soldiers from any state. On April 12, 1861, Confederate troops bombarded Fort Sumter, a Union position off the coast of Charleston, South Carolina. With the fall of Fort Sumter President Lincoln called for 75,000 troops to suppress the rebellion. More southern states, such as Virginia, Arkansas, Tennessee and North Carolina, joined the Confederacy. Kentucky Governor Magoffin refused Lincoln's call for troops, stating, "Kentucky will furnish no troops for the wicked purpose of subduing her sister Southern States." The next day, however, Magoffin had to turn down a similar request for troops from Confederate President Jefferson Davis (also born in the Bluegrass State). On August 5, 1861, state elections ended the policy of Kentucky's neutrality. As Southerners boycotted the election, Unionist candidates won a sweeping victory. On August 21, 1861, a detachment of 200 Federal cavalry arrived in Lexington. This caused alarm, as units of the Lexington home guard lined up behind an old brass cannon to face the Union troops, but through negotiations the Union soldiers were permitted to depart Lexington for their camp thirty miles from the city. Responding to Union troops arriving on Kentucky soil, Confederate General Leonidas Polk occupied Columbus, Kentucky, on September 4, 1861. On September 19, 1500 Union troops marched into Lexington and pitched their tents on what was then the old fair grounds. Orders were soon given to disarm the state guard companies. On the night of September 20, Lexington's most famous Confederate, Captain (later Brigadier General) John Morgan, moved some guardsmen with weapons out of the city. Morgan himself left Lexington the following evening with fifteen or twenty followers, to join the Confederate rendezvous on Green River. The Lexington men who joined the Confederacy formed Company B of the Second Kentucky Infantry, and were originally based at Camp Boone, in Montgomery County, Tennessee. Lexington's Confederate Brigadier General and guerrilla raider John Hunt Morgan was born in Alabama, but was long a resident of Lexington, Kentucky. The northern press referred to him as a freebooter, but in the South he was known as "the Thunderbolt of the Confederacy." By late September 1861, Northern troops under Ulysses S. Grant seized Paducah and Smithland, Kentucky. On September 18, Confederate forces under General Albert Sidney Johnston occupied Bowling Green and fortified the town. Johnston quickly established a defensive line that spanned the southern portion of the state. Lexington by this point was a Union garrisoned city, and the Fourteenth Ohio arrived to reinforce the city, the first out of state forces to do so. In October, Lt. Rittenhouse of the First U.S. Artillery opened a recruiting office for the Union forces in Lexington. The Masonic Hall on Walnut and Short Streets, which was demolished in 1891, later took on this function, after serving as a hospital and prison during the Civil War. Confederates held meetings in Russellville in late October and mid-November and established a provisional Kentucky state government that was admitted into the Confederate States of America on December 10,1861. Its capital was Bowling Green, but this government withdrew with the Confederate army in mid-February 1862 and, despite a brief return the same year, spent most of the Civil War in exile. In early 1862, Union victories at Mill Springs combined with the Confederate losses of Fort Henry and Donelson to (then) Brigadier General Ulysses S. Grant's Federal armies caused General Johnston to abandon the state for Tennessee. The Confederates, however, would soon return. 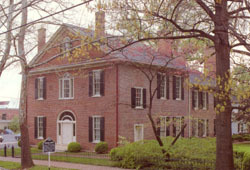 The Mary Todd Lincoln House, in Lexington, Kentucky. Kentucky was the birthplace of Abraham Lincoln and Mary Todd Lincoln. In mid-August of 1862, the Confederates launched a two-pronged offensive into the border states of Maryland and Kentucky. Leaving Knoxville on August 14, Confederate Major General Edmund Kirby Smith bypassed to the west of the Union-held Cumberland Gap and thrust deep into eastern Kentucky. On August 30, Smith almost annihilated a Union force of 6,500 near Richmond, Kentucky, despite an attempt to stem the battle tide by Federal commander Maj. General William Nelson, who arrived at 2 p.m. from Lexington. However, the Confederates won, and August 30 proved a bleak day for the Lincoln administration; coupled with the Richmond disaster was the Union defeat at Second Manassas in Virginia. Lexington prepared for Confederate occupation, and the Union soldiers destroyed government stores and ammunition before retreating. When Smith's 11,000 Confederates entered Lexington on September 2, 1862, they were cheered, and Smith wired the Confederate high command in Richmond; "They have proven to us that the heart of Kentucky is with the South in this struggle." The Battle of Perryville, fought between Confederate General Braxton Bragg and Union General Don Carlos Buell on October 8, 1862, was a tactical victory for the Confederates, but also a strategic defeat. This battle, which was the largest Civil War engagement in the Commonwealth, killed and wounded over 7,500 troops. 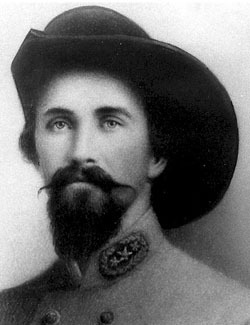 Although the Southerners whipped the Federal left, Bragg was forced to withdraw his outnumbered army from the state, ending his invasion and dashing the hopes of a Confederate Kentucky. The Confederates left Lexington on October 8, and by October 16, the Union forces returned. Ashland, the home of Henry Clay, was occupied by Union Major Charles B. Seidel, but on October 18 John Morgan and his cavalry surprised Major Seidel at Ashland and captured him and his command in broad daylight. 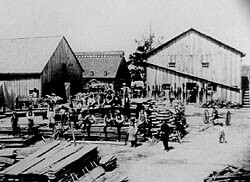 After outfitting his command with new horses, colt revolvers and other captured goods, Morgan's men burned the government stables and railroad depot before leaving Lexington. By the winter of 1862-3 refugees from East Tennessee, which was largely sympathetic to the Union, and escaped African-American slaves, began arriving in Lexington. Soon, a large African-American recruitment ground, located south of Nicholasville in Jessamine County, called Camp Nelson, began recruitment in March 1864. Eight African American regiments, called the United States Colored Troops, were founded at Camp Nelson and three other regiments trained there. Kentucky slaves who enlisted in the Union cause were immediately freed. The 13th Amendment finally freed all of Kentucky's slaves in December 1865. African Americans comprised 12 percent of the Union army by the end of the Civil War, and had engaged in 41 major battles and 449 smaller operations. On June 8, 1864, Morgan returned to Lexington for the final time during the Civil War. With 2,700 men Morgan left Virginia on May 30 and rode into Kentucky. Morgan struck Mount Sterling on June 8 and captured a garrison, then headed for Lexington, to procure Federal supplies for some of his command who lacked mounts. Hundreds of cords of wood at the Kentucky Central Railroad building near the Lunatic Asylum were set on fire, and, as Coleman records in Lexington During the Civil War, one Confederate soldier recalled "though we had but four buildings burning they were nigh circled half the town and the illumination suggested the appearance of a general conflagration." According to Coleman, Reverend Pratt, a native of Lexington, wrote in his diary, "It looked frightful and we feared the town would be set on fire. The federal forces retired to Fort Clay and commenced throwing shells over the town. It was frightful to see those missiles of death whizzing over our heads." Morgan's men, tired and hungry, looted Lexington. Coleman also quotes a contemporary account from The Observer and Reporter, a local newspaper, which stated that the raiders "proceeded to help themselves to whatever they wanted, and did so unstintingly. They broke open nearly all the clothing and hat stores in town together with Mr. Spencer's sadderly establishment from which they took everything they desired." Although Morgan and his men left town after a few hours, Mr. John Clay lost about $25,000.00 worth of fine horses to Morgan, and Morgan's men also took $3,000.00 in gold and over $10,000.00 from the Branch Bank of Kentucky. Morgan rode north to Cynthiana, and in two days of fighting he captured Union Brig. Gen. Edward Hobson's command but was soundly defeated by Union General Stephen G. Burbridge. Morgan barely escaped with a handful of troopers back into Virginia. However, Morgan's luck, which had been phenomenal, would not last. John H. Morgan was killed in battle on September 3, 1864, near Greeneville, Tennessee, when he and his men were surprised by body of Union cavalry under General Alvin C. Gilem. Given a state funeral in Richmond, Virginia, he was buried in Hollywood Cemetery and then reinterred with honor in 1868 in Lexington, Kentucky. After Morgan's last raid, the Civil War in Lexington was over. Nationally, the Civil War began to draw to a close with the surrender of Confederate General Robert E. Lee's Army of Northern Virginia at Appomattox, Virginia, on April 9, 1965. During the conflict, over 75,000 Kentuckians fought with the Federal army, while approximately 25,000 of their fellow Kentuckians enlisted in the Confederacy. Over 20,000 of the Union soldiers from Kentucky were African-American. Of those 100,000 Kentuckians who served, nearly 30,000 died. At least 10,000 were killed in battle, while the remaining 20,000 fell victim to disease and exposure. Gatehouse and office of Lexington Cemetery, where 7 Civil War Generals are buried. Lexington bore the conflict with mixed loyalties. The town was occupied by both sides, and the memory of the conflict was not soon forgotten. The Bodley-Bullock House, at 200 Market Street, was at different times the headquarters for both Union and Confederate forces during the occupation of the city. The congregations of most of the Protestant churches split over their loyalties; the Christ Church Episcopal at 166 Market Street, under the authority of Reverend Jacob Shaw Shipman, was a rare example of a congregation that maintained its unity during the conflict. 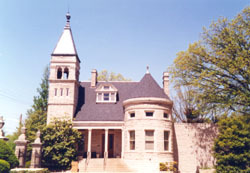 In Lexington, the Lexington Cemetery at 833 West Main Street provides a self-guided tour for the historic portion of the cemetery. There are at least seven Civil War Generals buried in the cemetery, which also includes the graves of numerous soldiers from both sides. 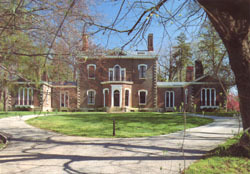 The Hunt-Morgan House, at 201 North Mill Street, is a house museum, which includes period furnishings and a second-floor Civil War museum. This was the home of Confederate Brigadier General John Hunt Morgan. The Mary Todd Lincoln House at 578 West Main Street in Lexington contains articles from both the Todd and Lincoln families. Finally, Kentucky's tradition of meditating between the South and North owes much to U.S Senator, Speaker of the House, Secretary of State and presidential candidate Henry Clay, who lived at Ashland, on 120 Sycamore Road, Lexington. Although Clay died in 1852, he was the chief author of the Compromise of 1850, which helped hold the Union together in the decade prior to the Civil War. Parts of this article were taken verbatim from the pamphlet "Kentucky's Civil War Heritage Trail," published by the Kentucky Department of Travel, Capital Plaza Tower, 500 Metro St. #22, Frankfurt, KY 40601-1968. Lexington During the Civil War by J. Winston Coleman, Jr., Commercial Printing Co.; Lexington, Kentucky,1938 also provided much information. Information was also taken from The Smithsonian's Great Battles and Battlefields of the Civil War by Jay Wertz and Edwin C. Bearss, William Morrow and Company, Inc. New York, 1997; the Encyclopedia of the Confederacy, Richard N. Current, Editor in Chief, Simon & Schuster, New York, 1993(especially the articles on "John Hunt Morgan" by James A. Ramage and "Kentucky" by Lowel H. Harrison), the Encyclopedia of the American Civil War a Political, Social, and Military History, Volume III and Volume 1V, David S. Heidler and Jeanne T. Heidler, editors, Santa Barbara, California, 2000, especially of note Gregory J.W. Urwin's piece on "United States Colored Troops" in Volume IV, from which the number of battles African American troops participated in and the percentage of the Union army comprised of African American troops.